Fall is in the air and with the change of season brings new combinations of entertaining options, seasonal ingredients and fall flavor combinations. As the summer heat begins to recede into cooler fall temperatures, the cooler weather generally allows our taste preferences to transition into more SILKY or MELLOW wines that highlight the seasonal fall flavors. We like to think of Petite Sirah as a gentle giant, robust and powerful, but soft in tannin and mild in spice with enough acidity to keep the wines balanced for tailgating favorites such as burgers, brats and chili. 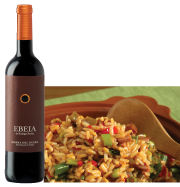 Tempranillo Dense red currant and raspberries with a hint of roasted almonds and mint on the finish makes a great pairing for the spicy and hearty flavors of jambalaya. 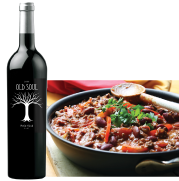 Delicious old world flavors of dried raspberry and cherry with a subtle earth notes make this a great pairing for savory flavors or mushroom and wild rice. This easy to drink Merlot is soft, juicy and plush. Bright aromatics of black cherry, blackberry, clove and nutmeg swirl in the glass. 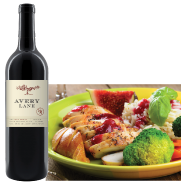 The soft tannins make it an ideal pairing for fall dishes featuring cranberry and figs. 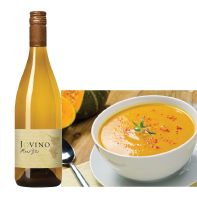 The silky texture, orchard fruit aromas and flavors of Oregon Pinot Gris present a lovely pairing option for butternut squash, with enough acidity to cut the richness of the squash and enough fruit flavors to balance the sweetness. 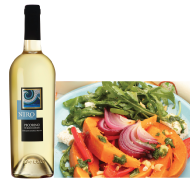 This unique white wine is a great pairing with fresh pumpkin flavors. The silky texture combines with ripe tropical fruit aromas and flavors that finish with a hint of sage and floral notes. 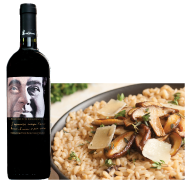 This entry was posted in Wine Trend Articles and tagged autumn entertaining, autumn wine, butternut squash, dievole, fall entertaining, fall wine, football tailgating, jambalaya, jovino, mushrooms wild rice, pecorino, pinot gris, pumpkin, rinscimento, sirah, tempranillo, wine, wine pairing. Bookmark the permalink.